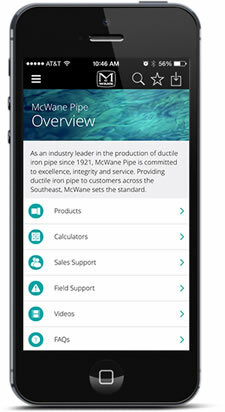 Below you can find the different joints that McWane Ductile offers for ductile iron pipe. For more information on sizing and other specifications, download the submittal sheet located underneath each individual joint. McWane Ductile is now taking pipe protection to new heights with the innovative V-Bio, an enhanced polyethylene encasemen. Read more here. Simple. Sturdy. Reliable. The predominant gasket employed throughout the ductile iron pipe industry by several pipe manufacturers. Made of flexible and resistant rubber, the Tyton gasket provides a permanent watertight seal through radial compression provided by the pipe spigot within the finished joint. Simply put, the most-widely accepted and installed integrally-cast restraint joint system in the ductile iron pipe industry. Proven as a versatile and easy-to-use item, this joint is flexible, sure, and watertight to and beyond its 350-psi pressure rating while preventing longitudinal separation of the joints whether installed above or below ground. TR Flex utilizes the Tyton joint gasket for a watertight seal along with a factory adapted spigot and extended bell casting to provide positive and permanent joint restraint. The "original" modern pipe joint, circa 1925; the mechanical joint remains in use primarily as a means for connecting fittings, valves, and similar appurtenances to a pipeline. The nuts, bolts, and gland featured in the joint provide a permanent watertight seal to 350 psi and more through a “stuffing box” compression of the gasket into its counterpart triangular recess of the joint. All the best of Tyton or Fastite rubber-gasket sealed ductile iron pipe joints with triple the maximum deflection available from either. Designed and used in subaqueous installations where lateral forces and an unsure bury condition demand a strong yet flexible restraint joint piping system. 15-degrees of deflection per joint equates to a 4-1/2 foot available offset in every full length of pipe laid or launched. The Mechanical with Tyton Joint pipe combines the ease of connecting fittings and valves with the simple, reliable, and proven Tyton Joint gasket sealing system. Available in sizes 6" through 24", this dual purpose ductile iron product could be used in both push on and restrained applications. Please click here to view the DIPRA Installation Guide for Ductile Iron Pipe. For further assistance, please check out the rest of our installation guides here. Fabricated pipe is made to custom lengths to meet specific project needs. Fabricated pipe can be cement, glass, or Protecto 401 lined to meet all applications. Exterior coatings available include standard Bituminous, Tnemec primers and epoxies, as well as other specialty coatings as required.